Frequent use of vibrato ritardando confuses the melody, frequent use of other vibrato leads to a lax style. They only love the fashionable style, and play the qin so as to produce a rude noise. This style is aimed only at captivating the common fancy. The pure tones are simple - but who can appreciate them? People only say that Qiyan does not use the wooden sounds. There have been other traditional criticisms of more ornamental styles of play,3 but this quote is mentioned here mainly to put my comments on the Suxin Silk Strings into a personal context. The strings they sent me, their smoothest and the smoothest silk qin strings currently available, are in particular ideal for people used to the smoothness of metal or composite strings: they make it easier to play all the ornaments so popular today.4 I do not criticize that style the way Yelü Chucai did, but my own style not being so ornamental means that I can also be very happy with strings not as smooth as this. In this I am also influenced by other factors. 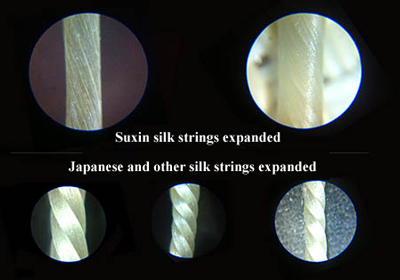 Suxin Silk Strings for qin (they are also available for pipa and maybe later for some other instruments) came onto the market in May 2014, after several years of research by a team led by Fang Suxin;6 they are on sale through http://en.suxinsixian.com/, http://www.suxinsixian.com/ or through Taobao. For the heavy gauge strings the 4th string is wrapped; for light gauge it is unwrapped. The tension is controlled largely by changing the string glue recipe. With regard to this last characteristic, whereas in the recent past (perhaps since the Song dynasty) the lower four strings have always had the mesh wrapping, with Suxin strings sometimes only the lower three are wrapped. This is said to be in line with more ancient practices. With Suxin strings, at least the early versions,9 all the original silk filaments from the silkworm seem to be twisted either directly into the whole string, or they are twisted into very small strands and thence into the silk strings themselves. The traditional method of making qin strings uses a different technique, sometimes called a "rope technique". Here the basic filaments are first twisted into strands, perhaps 12 filaments to a strand, then these strands are in turn themselves twisted together to make the strings (for this see further details; there is also a traditional account here). It was not difficult to put the strings on one of my qins and tune the lowest strings to Western "C". Within two days they had sunk several whole tones and the instrument had to be re-strung. This seems to be true of all silk strings, though some expand a lot more than these seem to. Since then the Suxin strings have been quite stable, though from my experience so far they tend to be even more stable with the lowest string tuned to B rather than C.
Although the strings came knotted, I found the knots on the upper strings to be too small (one slipped through the tassel), so I had to re-tie them. In the process of doing the stringing I did encounter some of the problems mentioned above, mainly the issue of whiteness on the strings. This did not appear as I was doing the stringing but was already in the strings as they arrived. The strings were neatly coiled and I do not know whether this happened as they were packed or during shipping, perhaps if the envelope itself was twisted. Although the strings have a lovely tone, I am also happy with the tone of other good quality strings. Perhaps I can best phrase my reaction by saying that I feel very fortunate to have the opportunity to use both the Suxin strings and some of the other high quality strings. Also, as I write this (July 2014) I have only been playing the Suxin strings for a short time, and I cannot really judge strings properly until they have what might be called "matured": become more mellow with use, something that usually takes some months with regular play. There is information about Fang Suxin's strings, "素心絲絃 Suxin Sixian", on this website and on this Facebook page. The above image was copied from an advertisment for Suxin Silk Strings on Taobao. I believe it is intended to show the strings when new. The Suxin string on the left must be unwrapped; it was based on this picture that I concluded that the string was not made using the rope technqiue; Wang Geng says that now all the strings are made using rope technqiue. The image upper right is a wrapped string. Regarding "Japanese and other silk strings expanded", the image here shows my Marusan Hashimoto strings after they have been broken in. See for example this comment from the Ming dynasty on the Jiang style being too "多煩瑣 loaded with detail". On the other hand, when performing with metal strings if your fingers get clammy you can simply put oil on them and keep playing. With Suxin strings, as with all other silk strings, if your hands become at all clammy then they will start sticking to the strings. While in Beijing in July 2014 I was able to feel a set of the strings Suxin is now making, but did not have a chance to play on them. Around the year 2011 Fang Suxin left a career in finance to devote herself to making silk strings for guqin. With technical help from qin maker 宋增霖 Song Zenglin and multi-instrumentalist 王耕 Weng Geng she began producing strings of increasingly high quality. In November 2013 Wang Geng brought a "gamma" set (third version) to New York, where we were able to test them out. They were very good, but Wang said that her fourth version, out in December, promised to be even better. (We also visited Alexander Raykov in Cortland, New York, to hear more about his silk strings for early Western instruments). Although the strings are now being made available to the public the silk string research will continue. Suxin is in fact making a much greater variety of strings now, using differing degrees of smoothness. Suxin has also started a new service to custom make qin strings. For this an initial fee RMB2,000 is needed, then we will try different gauges/tensions/specifications on the customer's qin; the result is a unique gauge for that one qin. A batch is three sets; for the standard version it is then 11,000RMB and for the premium version 20,000RMB. Suxin says that it is very wrong to make only three gauges for qins (中清, 太古, 加重) because qins vary a lot. An old painting called Illustration of Qin Making (斲琴圖 Zhuo Qin Tu) shows four major steps in making a qin, with the fourth step being called - "設絃審音 custom making the strings". The painting to which Wang Geng refers was the 斲琴圖 Zhuo Qin Tu (see upper right corner) attributed to 顧愷之 Gu Kaizhi (4th c. CE). It was preserved in 宣和畫譜 Xuanhe Huapu, a volume included in Treasure Boxes of the Stone Moat (石渠寶笈 Shi Qu Bao Ji), a Qing dynasty imperial catalogue of painting and calligraphy in their collection. Further comment here. I assume the glue is thick enough on the Suxin strings that it is only glue that is scraped, not the silk itself. Such thicker glue might also explain why the sound of the Suxin strings seems either more muted or more subtle compared to the Marusan Hashimoto strings. My understanding from Wang Geng is that now the Suxin strings all use a rope technique. Wang Geng says varnish is used "only in the 10cm on the playing position". Silk is very strong lengthwise but very fragile sideways - the outer filaments will always break. The (rope style of the) traditional oriental method twists the filaments so that as much of them as possible goes under the surface, and thus only very short hairiness develops. I have regularly observed that musicians using the same third string that I made in this oriental way on bass viol for 5 or 6 years, while I have gone through five or six smooth strings used the same way. We can see the smooth strings going hairy on some Western silk strings made in the 19th century - packages may even include brief instructions on how to burn off the offending little hairs, using a gas lamp. In addition, dirt and finger oil get in between the hairiness, or a longer filament just separates from the string, and the string fails in the end. Of course, it could be re-glued or cleaned and steamed, and such, but a modern western musician is trained as a string consumer, not a string technician. Alexander added that when filaments are twisted together under high tension into small bundles they fuse together and this is much stronger than connecting them with glue. Since I do not know how the Suxin strings are bonded together I cannot really comment on this other than say that perhaps only time will tell. The image here shows an extreme example of this (further comment). I have seen this happen on other strings as well, and am not sure of what is happening here, except that it seems to be more than on other good strings that I have used. In addition, I do not know details of the glues and varnishes used on Suxin strings. When Wang Geng was in the USA last year he was experimenting with varnish, and the cracking on the strings reminded me of experiences I have had with such varnish. I have been told that at present the varnish is only used on the area of the string where it is being plucked, but I may have misunderstood. I also am not sure whether it has been added when the strings were being boiled in their glue or at what time afterwards. While I was in Beijing Fang Suxin showed me how to steam the crinkles out of a string and make it smooth (see image). To do this she used a steamer with a hose. It did not seem very difficult, but it does require some care and, I suspect, practice. Wang Geng wrote (June, 2014; somewhat edited here) that the following instructions are included with the sets of strings that are sold. The black dots at the end of each string represent the string number. For example, three dots means the third string. Do not bend the strings seriously. Do not handle the strings as you would when drawing thread by hand because this will cause a lot of white marks on the strings. In particular, do not vigorously rub and twist the strings, as you must do when installing nylon metal strings. The best way to hold the strings during this process is to arrange each string into the shape of a solenoid, then pull from one end all at once. If the strings have been twisted or rubbed seriously during installation, there will be some white marks on the strings. The marks are caused by string glue cracking. The white marks won't affect the tone and playing. However, they can be removed by being treated by high temperature steam once securely installed on the qin. The white marks will disappear because the string glue inside is now reconnected. Once the strings are installed, any furs can be flattened out by applying "bletilla water" (白芨 baiji that has been boiled in water) or Suxin String-care Liquid. Bletilla water can be made by three distillations of 5 grams of bletilla mixed with water. First, notice the direction of the twist - a single string actually has thousands of twists and "unravel" just means there was one loose twist (caused by making the qin knot), so it can just be twisted back. When installing the strings on the qin, the installer can hold the unraveled part in two fingers, hold the entire string in a hand and twist them according to the other twists of the whole string. You will then see the unraveled part closing up, leaving only a white mark. At this point immediately pull the string on the qin and install it. The white marks may also happen when you pull the strings during installation, but this doesn't affect the smoothness and tone. 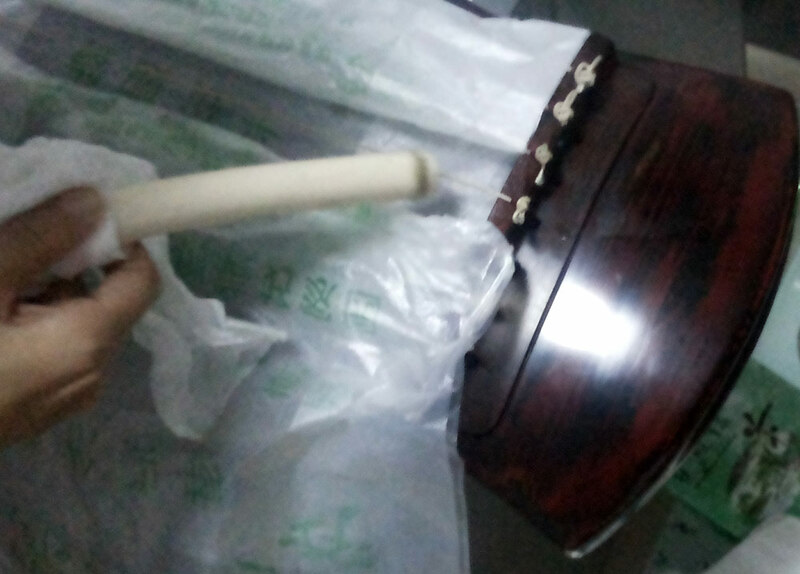 If you want to eliminate the white marks, cover the whole qin and put steam on the white marks (to let the inside glue reconnect); the string will then recover its original appearance. 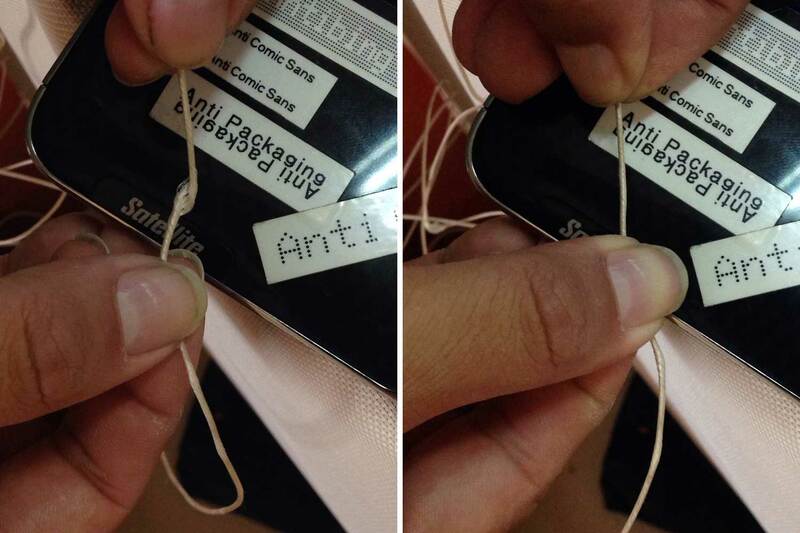 Wang Geng sent these two photos to show more clearly what he meant about twisting the string to fix the unraveling. However, he also added the following comment, "Once the strings are on the qin, no extra care is needed. If there are any furs, use 白芨水 baiji shui to smooth out the fur (calligraphers frequently use baiji shui.) Avoid vaseline or wax. Nevertheless, I'm starting to get somewhat nervous abot how mail buyers treat the strings during installation (I have not had a problem with buyers here in Beijing). I'm working on how to figure this in a further warranty." The premium version is superior in tone, and it includes a warranty of three strings - customers can ask to change up to three strings in total (for example, if they are not satisfied with a certain gauge); we pay the shipping. Five sets of pipa strings are also available. Any questions about this should go to 102665066@qq.com. The production is going nicely, and we are very happy with the current workers. Now we have a stock of around 20 sets. See comment above about new varieties being made. The reason for the crinkling is not clear to me: it does not seem to be a characteristic of the Marusan Hashimoto strings. Here I am influenced by the fact that for 40 years I have enjoyed playing on silk strings that are less smooth than metal strings or than the new Suxin strings, and have recorded over 200 pieces using these strings. Because of this I have become somewhat impatient with people saying they cannot play with silk strings because they are not as smooth as the metal ones. Now it is good that, assuming they can afford the Suxin Strings, they no longer have that excuse. And as I suggested above, these strings may be better for the modern style (whether that means Qing dynasty, 20th century or post Cultural Revoluation is another issue). For historically informed guqin performance they may also be equally suitable. However, I would like to know more about whether silk strings were really this smooth in the past, and if so, how was this done? If we cannot find evidence that it was by using varnish and this particular method of twisting the strings this does not mean these methods should not be used, but it does emphasize that further research is needed before definitive claims are made. We can read about the so-called ice strings but I still have not seen them or heard a credible account from someone claiming to have done so.